For those not familiar with this cut, the flat iron steak comes from the beef shoulder. It was identified in 2002 as a new retail cut by the National Cattlemen’s Beef Association in partnership with the University of Nebraska and the University of Florida. This effort was undertaken to find lower-priced cuts that could be trimmed into steaks and roasts that were flavorful and tender but could be offered at a lower price than more popular cuts. You’d think that meat people would know everything there is to know about what’s inside a cow. However, much depends on how the beef primal cuts are broken down into individual cuts. Do things a little differently, cut left instead of right, zig where you normally zag, and you can “create” a new steak cut that did not exist before. That’s how the flat iron steak came to be. 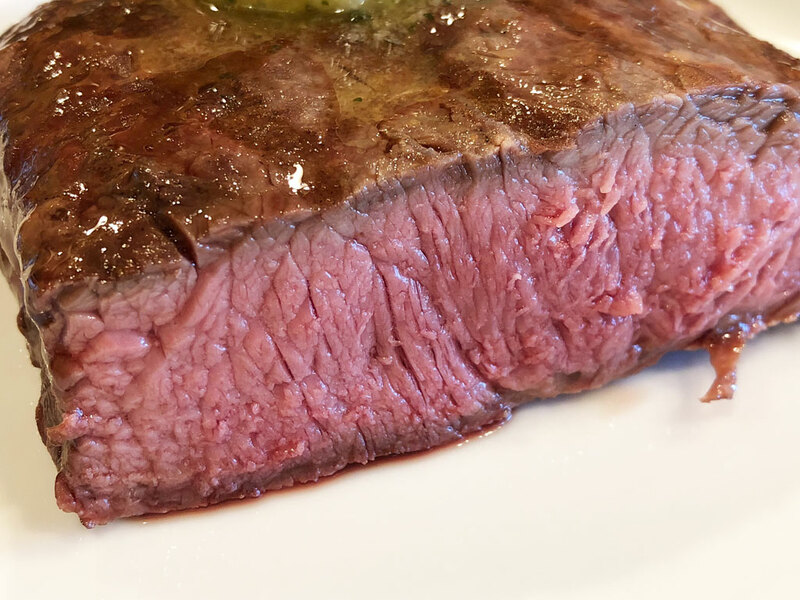 A flat iron steak contains a gristly membrane on one side. The gristle in my steak had already been removed by my butcher. 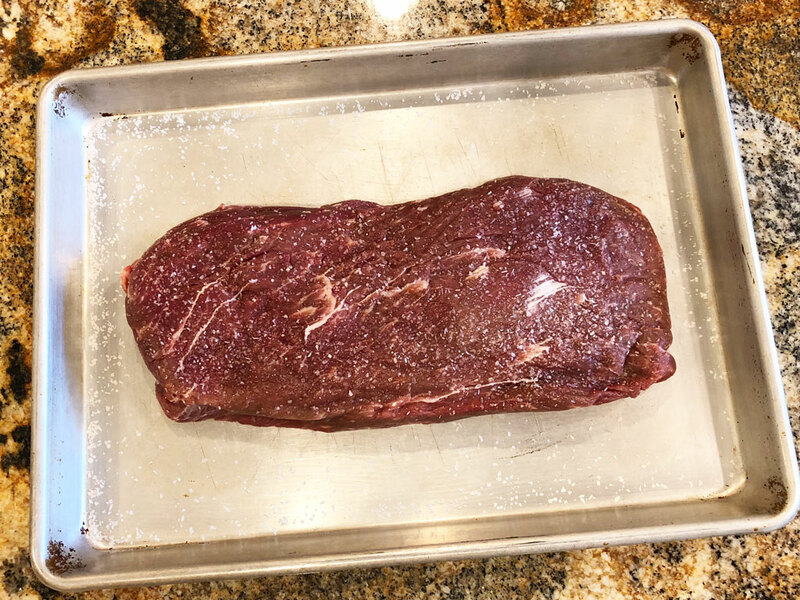 If you buy a flat iron steak with a line of gristle running down the middle of one side, you can ask your butcher to remove it, you can remove it yourself, or you can cut around it after grilling. The steak shown here weighed 1.44 pounds. I salted it generously on both sides with kosher salt and let it sit in the refrigerator for 90 minutes, then another 30 minutes at room temperature before grilling. 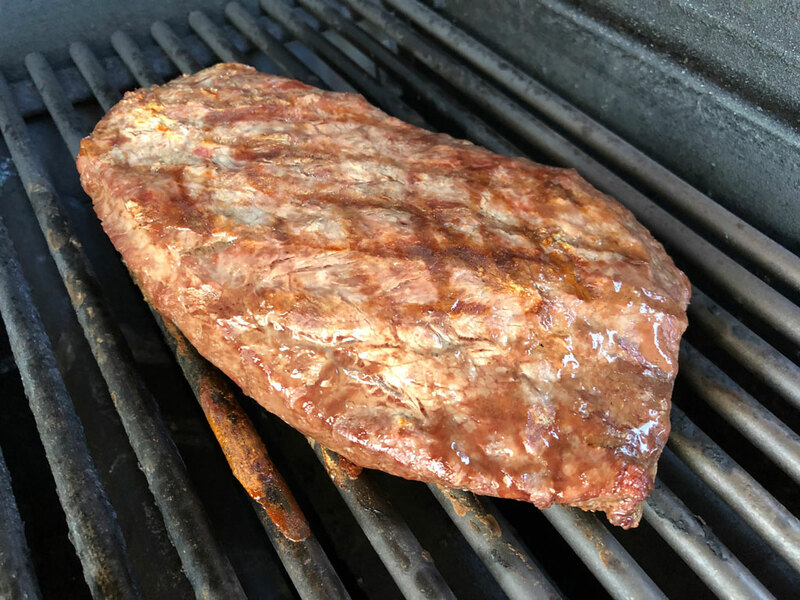 I had no idea how long or at what temperature to grill a flat iron steak, so I visited Weber.com for advice. This is where things started to go sideways. The recipes I found suggested grilling four 6- to 8-ounce steaks over direct medium heat (350-450°F) for 6-8 minutes for medium rare, turning the meat once or twice. This seemed like a very short cooking time for medium heat, and I had a single 1.44 pound steak, not multiple smaller ones, but I trusted the cooking recommendation and gave it a try. I preheated the grill for more than 10 minutes. My Summit 450 has four burners; I set two burners on medium, one burner on low, and left the last burner off. My thinking was that I’d cook the steak over the medium side of the grill and if there was a flare-up I’d have a lower heat area where I could move the steak. I placed the flat iron over the medium heat and cooked it for two minutes, then flipped. I repeated this three times for a total of eight minutes of cooking. The steak was nowhere near finished, both visually or by internal temperature…it was somewhere in the low 100s. So the recommended cooking method failed me. Was the grill not hot enough? 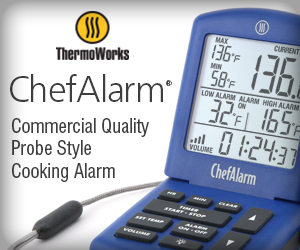 Was eight minutes not enough grilling time? What should I do? The answer is don’t freak out but press forward and continue doing what you’re doing until you reach your desired internal temp, in this case around 140°F. So I continued grilling over medium heat in two minute increments and flipping, and by the time I got to 14 minutes I had a steak that looked attractive and hit 135-140°F for something in the medium rare to medium range. 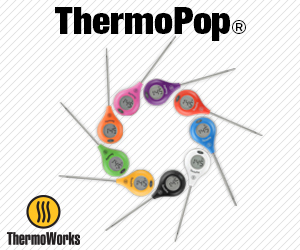 I used my trusty Thermapen to get an accurate temp reading in several spots. 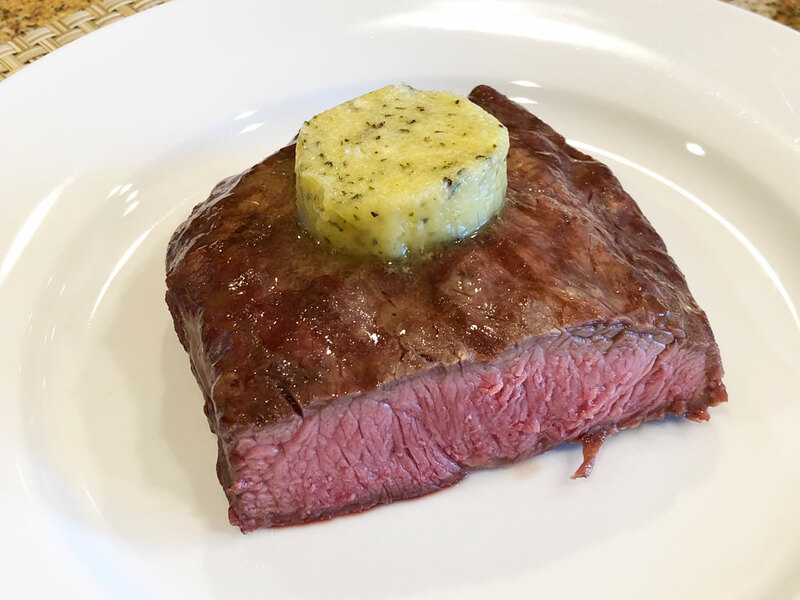 I removed the steak from the grill and let it rest for a couple of minutes under foil while I got the plates and some pats of compound butter ready. I cut the large steak into two portions, added the butter, and was ready to enjoy a really nice meal! You can see that this steak didn’t have the most impressive sear on the exterior, but it tasted really nice, the interior was perfectly cooked, and it was very tender. A big success, despite some cooking challenges. If you’ve not grilled a flat iron steak, I’d suggest you give one a try. It’s not the same as a strip steak or a ribeye, but it’s also not as expensive as either of those cuts for the same grade of meat and makes for an affordable weeknight meal. Looking back, I don’t see anything wrong with grilling this steak over direct medium heat and flipping it frequently. However, next time I will ignore time and cook to just short of my desired internal temp, then remove from the grill, crank the heat to high, and return it to the grill for a final reverse sear.